Over the course of the last couple weeks I have developed strategies to make sure I get the nine cups of veggies, one teaspoon of minerals and four ounces of grass-fed meat or wild seafood a day. I thought I ate a lot of veggies before, but this much requires some planning on my part. 1. Start the day with a lot of produce and some seaweed. This could be something like the breakfast skillet, or a smoothie. The video below is Dr. Wahls making a smoothie of 1 cup kale stems, 2 cups orange juice, 1/4 teaspoon of powdered kelp and a banana. 2. Soups are wonderful ways to fit in more vegetables and broth. One cup bone broth counts for the day's mineral requirements. I like cabbage soup, butternut beet soup, and beef mushroom and barley soup. 3. Salads feel more like a meal with a cooked component. I've had a hard time thinking of a salad as a meal. However, they are an excellent way to eat the three cups of greens. I find that adding a cooked something gives a warm contrast to the cold leaves and makes the salad feel like it has more substance. Last night for dinner we had grilled wild salmon on a bed of lettuce and spinach with grated carrots, sliced radishes and warm pan roasted butternut squash with garlic. 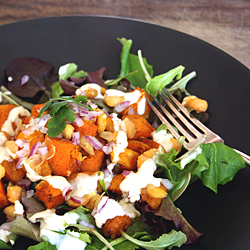 Another example would be the warm butternut and chickpea salad. I just posted the recipe for the Sardine Avocado Citrus Salad which has sauteed onions and warm sardines. It's good, I promise and the sardines count towards the one serving of organ meat a week! 4. End the day with a sweet fruit smoothie. Now I'm not saying I don't miss baked desserts or ice-cream but a smoothie is a nice way to make sure that you've got all the bright colors and have a little something sweet. 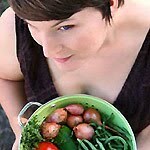 The Wahls Diet includes three cups of bright colors per day; one cup of each of red, orange/yellow and blue/black. 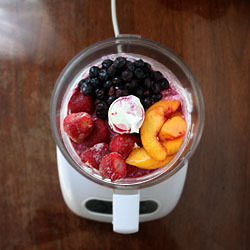 I've taken to making a smoothie of frozen strawberries, peaches and blueberries with some 100% grape juice concentrate. I adjust the ratio of fruits to make sure I have gotten all my bright colors. Usually I am missing the blue/black so I make sure to add a full cup of blueberries. 5. Grain and sweet craving can be assuaged with granola and dark chocolate. I'm not completely sure what Dr. Wahls thinks about dark chocolate, but I have seen cocoa powder in her recipes so I think as long as it is not sugary chocolate we are in the clear. 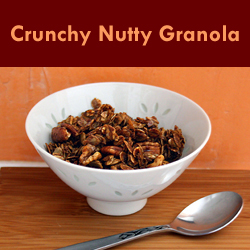 I enjoy the granola recipe with a sprinkling of high quality dark chocolate. It tastes like a chocolate chip cookie. There you go. How do you make sure you eat well every day? 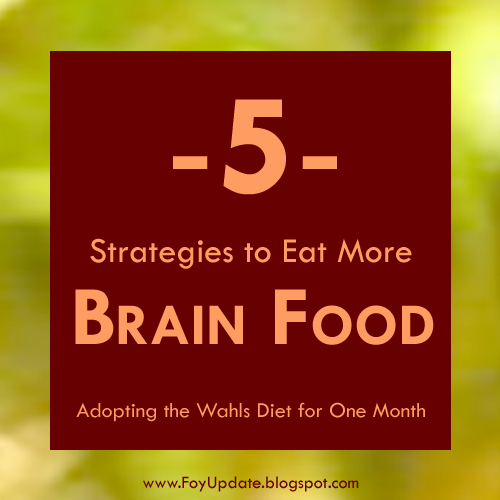 For more recipes and ideas visit my Wahls Paleo Pinterest Board. Fantastic post! It's so wonderful to find someone who understands how to eat for MS! Please post your cabbage soup recipe.I found your blog link on FaceBook at the Whals Foundation page. I munch on a bit of seaweed while I put everything in the blender. For lunch: home made hummus with veggies. Supper: Sweet potato, an onion, 8oz mushrooms, garlic and kale flakes (fresh kale in summer and fall) fried in a bit of coconut oil. And although grains and grasses aren't encouraged I do enjoy some brown rice or quinoa. 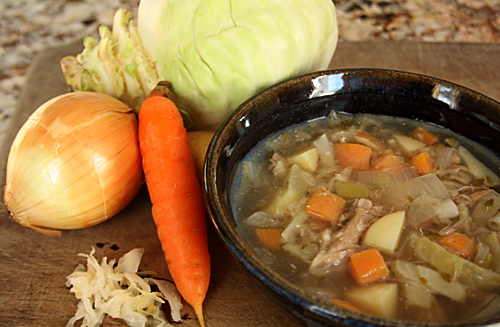 I just linked up the cabbage soup recipe in the article! Thanks for the reminder. Great Post! Have a great week and thank you so much for sharing your awesome recipe with Full Plate Thursday. What a great post. I'm a big believer in Dr Wahls diet. It's a great blend of a Nourishing Traditions diet but with more vegetables and fruit. I'm highlighting this post at Keep It Real Thursdays this week at beyondthepeel.net. Thanks for contributing. Thank you for sharing this yummy and delicious recipes with us! I'll try it for my family for sure they will love it.